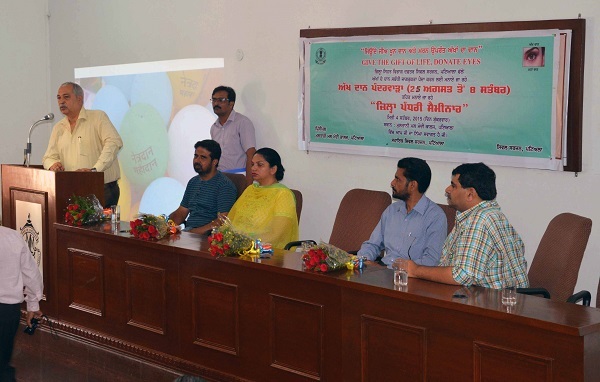 A seminar to make the students aware about eye-donation, under the ‘National Programme for Control of Blindness’ was oragnised at M M Modi College in association with the Health Department (Civil Surgeon Office), Patiala. Dr. Rajeev Bhalla, Civil Surgeon, Patiala inaugurated the seminar. He informed that 30th National Fortnight on Eye Donation is being celebrated in the country from August 25th to 8th Sept. 2015. He said that blood donation during life time and eye-donation posthumously is the noblest contribution towards the welfare of humanity. He informed that there are 35 lac blind people in our country which is about 20 percent of the world population of the blinds. Only 35,000 donors come forward to donate their eyes during the year which is far low as compared to the size of the problem. 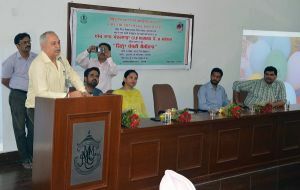 He appealed to the students to come forward and take a pledge to donate eyes. Dr. Khushvinder Kumar, Principal of the college, welcomed the guests and the expert speakers. He made an emotional appeal to the students to feel the pain and difficulties of the people who have lost their eyesight – He asked the students to make the society aware about the eye donation campaign. Dr. Harish Malhotra, Asst. 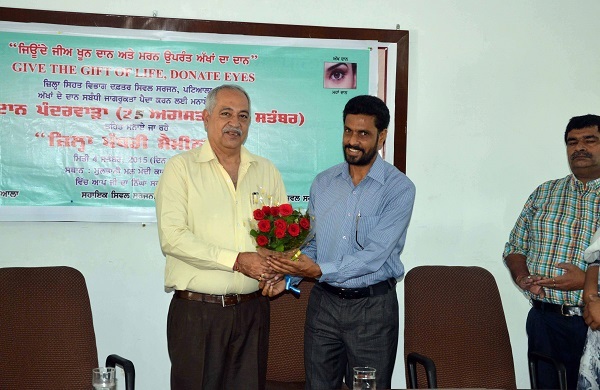 Civil Surgeon, Patiala also appealed to the students to spread awareness about the eye donation and work for the creation of a healthy society. Dr. Manpreet Walia, an Eye-specialist also motivated the young boys and girls for this noble cause. Sh. Hardeep Randhawa in his address asked the students to take safety measures in protecting their eyes during the festival days. He also appealed them to keep a distance of about 14 inches while reading books and working on computers. Sh. Krishan Kumar, Dist. Mass Media Officer of the Health Dept. and Mr. Amarjeet Sohi worked tirelessly to make this event a success. 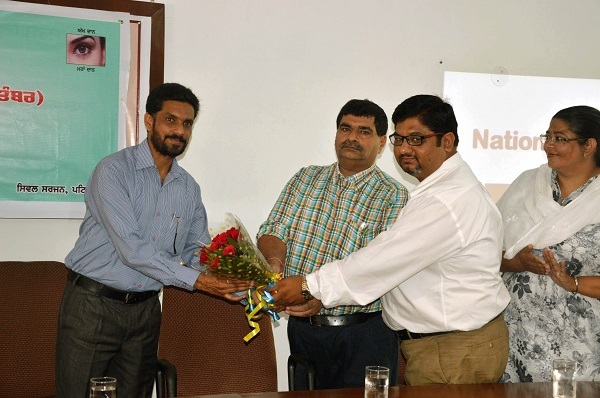 Dr. Rajeev Sharma, NSS Progarmme Officer of the college conducted the proceedings of the seminar and Prof. Harmohan Sharma presented the vote of thanks. Chief Guest Dr. Rajeev Bhalla, Civil Surgeon, Patiala addressing the audience during seminar. Dr. Harish Malhotra, Asst. Civil Surgeon, Patiala being honoured by the College administration.